In a speech Friday, Mnangagwa promised not to "squander this opportunity" to make some changes to the African nation. Emmerson Mnangagwa was sworn in as Zimbabwe's interim president Friday. During a speech to a packed stadium in the capital city of Harare, Mnangagwa promised not to "squander this opportunity" to make some changes to the African nation. He said he wants to revive Zimbabwe's economy by creating more jobs and attracting partnerships with investors. Mnangagwa said he wants to stamp out corruption and urged nations that have imposed sanctions on Zimbabwe to reconsider those sanctions. The new leader is coming into power after several weeks of political turmoil. Mnangagwa left Zimbabwe earlier this month after then-president Robert Mugabe fired him Nov. 6. 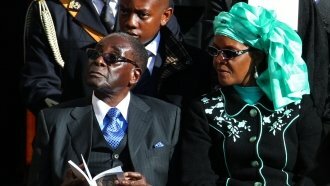 Many saw the firing as Mugabe's attempt to establish first lady Grace Mugabe as his successor. Mugabe's own political party ousted him Nov. 19. He officially resigned two days later. On Friday, Mnangagwa said he still views Mugabe as "a father, mentor, comrade in arms and leader." Zimbabwe's next election had been planned for 2018. Mnangagwa said it will be held as scheduled.